Boston, MA (Mar. 12, 2019) – Large commercial brokers are prioritizing workflow, analytics, and AI technologies to differentiate themselves in a competitive marketplace. In a new report, Business and Technology Trends: Large Commercial Brokers, research and advisory firm Novarica provides an overview of large commercial brokers’ business and technology issues, data about the marketplace, and several examples of recent technology investments by large commercial brokers. Workflow remains the number one problem brokers face. There has been a significant improvement in the last year in a new class of solution providers that offer automation to support new and renewal business. Brokers are investing heavily in analytics, business intelligence, and (more recently) AI and related technologies. Brokers are using any tool possible to grow their business profitably and to provide a differentiated customer experience from customer acquisition to customer service. Portals continue to be an important area of investment for carriers working with brokers. Broker demand is growing for carriers to provide straight-through processing portals for small commercial business. Large commercial brokers are investing in technology to differentiate themselves in a competitive marketplace using AI, analytics, and workflow technologies. 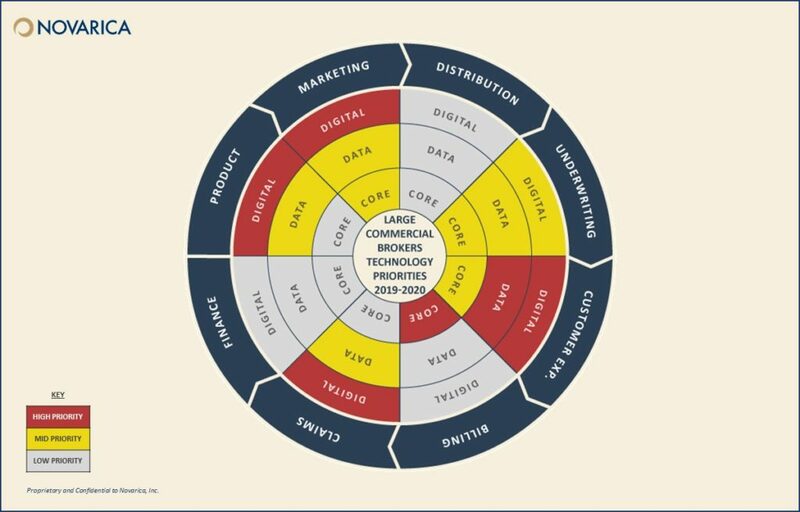 This report provides an overview of large commercial brokers’ business and technology issues, data about the marketplace, and several examples of recent technology investments by large commercial brokers. Top technology priorities for 2019 and beyond. Novarica helps more than 100 insurers make better decisions about technology projects and strategy through retained advisory services, published research, and strategy consulting. Its knowledge base covers trends, benchmarks, best practices, case studies, and vendor solutions. Leveraging the expertise of its senior team and more than 300 CIO Research Council members, Novarica provides clients with the ability to make faster, better, more informed decisions. Its consulting services focus on vendor selection, custom benchmarking, project checkpoints, and IT strategy. For more information, visit www.novarica.com.